This is not the familiar, jig-like tune generally associated with these words, but another English folk tune (or rather, children’s street song) which was wedded to the text by Martin Shaw in his valuable but little-known collection The English Carol Book in 1913. 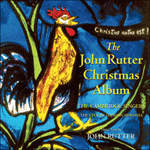 John Rutter’s setting was made for The Bach Choir in 1977. But Joseph and his Lady?